Kerry Frazier teaches through "Armonías" music exchange, including students from Nashville and Colombia, South America. Jeremiah, 11, of Nashville, drums in the Armonías program. 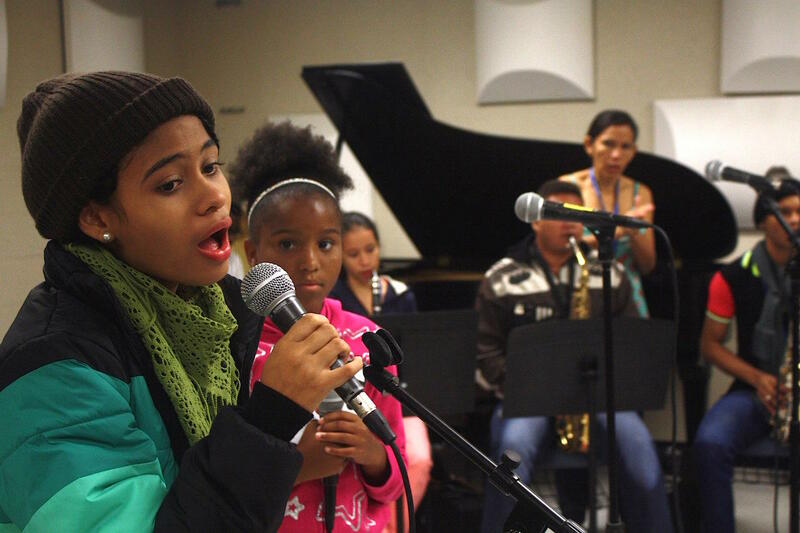 Yoheny, 15, and Kennedy, 11, sing together on "I Will Survive." There’s a new band in Nashville playing R&B hits and getting some decent gigs. And they’re made up mostly of middle school students from Colombia, South America. The young musicians are in town this week as part of an international music exchange known as “Armonías.” They’ve paired up with Nashville students to learn from Tennessee State University instructor Kerry Frazier and the non-profit From The Heart International Education Foundation. Frazier — Winn’s son — has been a visiting instructor in South America for several years as part of the exchange, which is funded by several charities and the Colombian government. But this is first time that a band purely of student performers has come to Nashville. Yoheny, 15, of Colombia, sings lead on "I Will Survive." They’ve had a chance to tour Nashville’s musical landmarks and will spend next week learning to play the blues in Chicago. Later this year, the group will reunite when Nashville’s contingent heads south to the Mompox Jazz Festival. Colombian instructor Liliana Atencia, of the Santa Maria de Mompox School, said music is the “shared” language. So students who may seem foreign at first, and not look the same, can begin to understand one another. Hear Liliana Atencia discuss the benefits of international music exchange (Spanish). The students will perform at 7 p.m. Wednesday at Salsa r­­estaurant on Palmer Place, on Friday at Rocketown, and for a private show for Nashville dignitaries including Mayor Megan Barry. 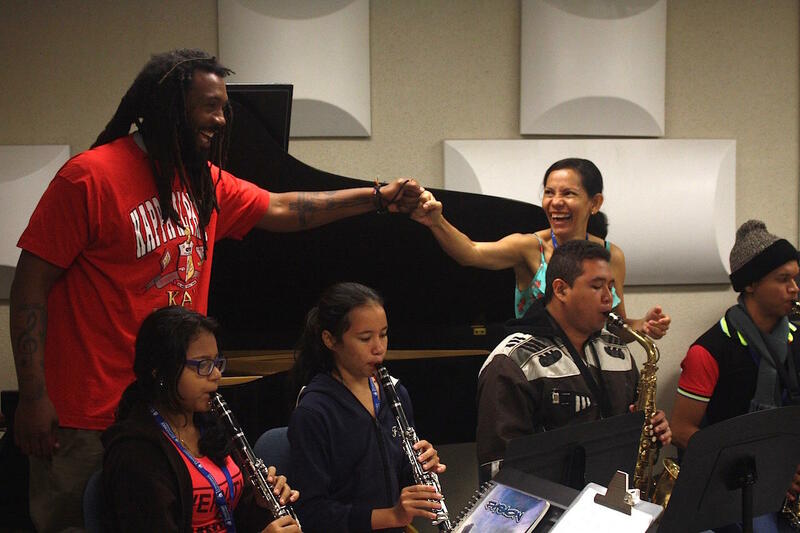 Kerry Frazier and Liliana Atencia fist bump during a rendition of "Rehab" by students in the Armonias band. The National Museum of African American Music opened its first exhibit this week — in a way that was different than expected. After a fifteen-year struggle to build a physical museum in Nashville, the organization is starting with a digital project called "Rivers of Rhythm." Nashville’s public schools are trying to show the payoff for all the money being funneled into music education. The city has put $14 million into a district-wide music program, at a time when the school system is trying to find money for more math tutors and reading coaches. About 30 families recently went to the Tennessee Performing Arts Center for the first time. Just stepping into TPAC — soaring windows and balconies and full of dressed-up people — was almost excitement enough for sixth grader Blake Allen.